Envoy separates her personality into three aspects in order to focus on a task -- in this case, writing a letter without being overwhelmed by her emotions. A vendor puts the finishing touches on Envoy's new dress, while Vielanika watches. Arch-Inquisitrix Esther questions Ambassador Brishen about the disappearance of eight Savanite slaves from the basement of the Ashdod Embassy. Jynx leaves Shikouju's silver blade behind at Falcon's Watch. Leeta (aka Fire-Mane) has a strange dream about the Holy Hand of Purification. Kensington and Roho pursue the floating ball of fluff that Scarlet has become. In the rust desert of Abaddon, Zoltan, Kensington and Wynona sneak a ride on the back of a train of carriages pulled by a coal-powered steam engine. 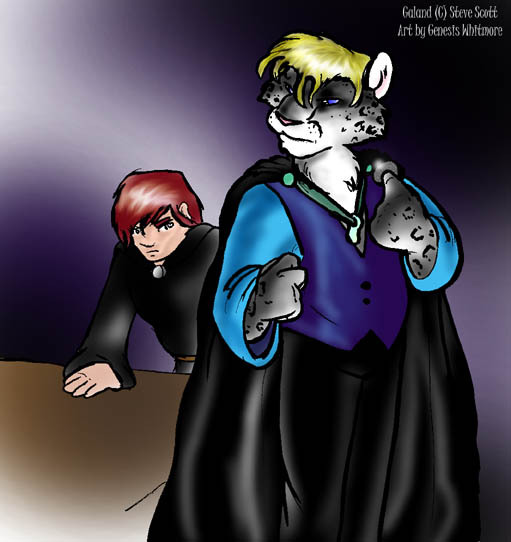 Galand contemplates a silver coin given to him by the Astromancer and whether or not he should accept it. Pouncer gets her new toy, a bug doll that she has named ... GISH! Lochinvar pursues a trail on the planet Arcadia that leads him to Glot - the Titanian that mysteriously went missing on the Temple's last expedition to the planet. Chiaroscuro meets his first Naga, Delilah, at Sabaoth's palace. Kensington improvises a platter to use as a shield in a fracas that breaks out in the Confederate Life Dome.